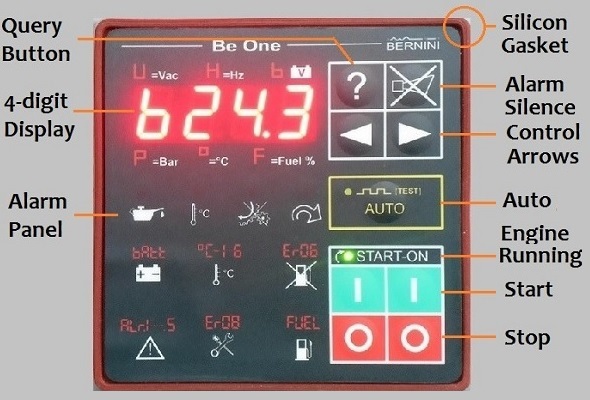 The Be1 is an user-friendly generator AUTO START MODULE. By adding only a few automotive relays you can make an auto start panel in a few time. Be1 interfaces with any kind of sensors: analog or digital. You can use Be1 to refurbish the control panel of any style of engine: gas, gasoline or diesel. In case you need to control the engine by remote, Be1 features a powerful serial interface that supports the MODBUS protocol. Software is provided free of charge. Thanks to the high-quality silicon gasket the Be1 features an IP65 ingress protection. The START/STOP push buttons are redundant, in this way you can expect a long life even in harsh environments. Be1 features 'avionics grade' display that will allow you full visibility of the instruments in between -30 up to 70 degree Celsisus. In case of shuts down the Be1, in addition to alarm messages on the display turns on a red light in case of Engine Failure (Oil, Temperature..), Over Speed and Fail to Start.